Three friends are the founders of Wind in Mind, three friends with different backgrounds but with a mutual love for open water and sailing since childhood. While living close to a sail loft, we have learned how sails are made and understood the value of good handicraft. Wind in Mind takes care of scrap sailcloth that otherwise would have be thrown away. Both thin colourful spinnaker cloth, and strong kevlar and carbon fiber laminates with fine graphic patterns come to use by us. "We borrow the handicraft from sail makers and combine it with our sense of design to create something entirely our own. The love for sailcloth we already had... Our products have the highest quality, are carefully handmade in durable materials, sometimes made as only one unique piece, and sometimes made in hundreds ..."
Annika Hadenius (to the right) Master of Fine Arts in Industrial Design educated at HDK University of Design and Craft in Gothenburg Sweden. 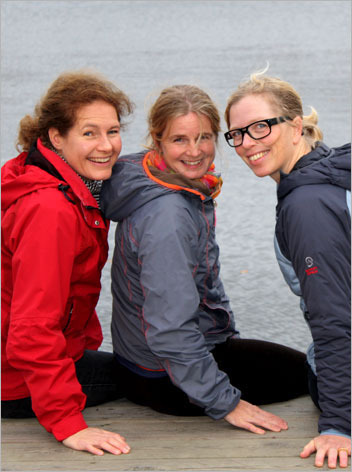 Annika Johansson (middle) Pharmacist educated at the University of Uppsala Sweden. Mari Wikström (to the left) Master of Science in Business and Economics educated at the University of Stockholm. ”Nature is my source of inspiration, especially the archipelago and the open water….